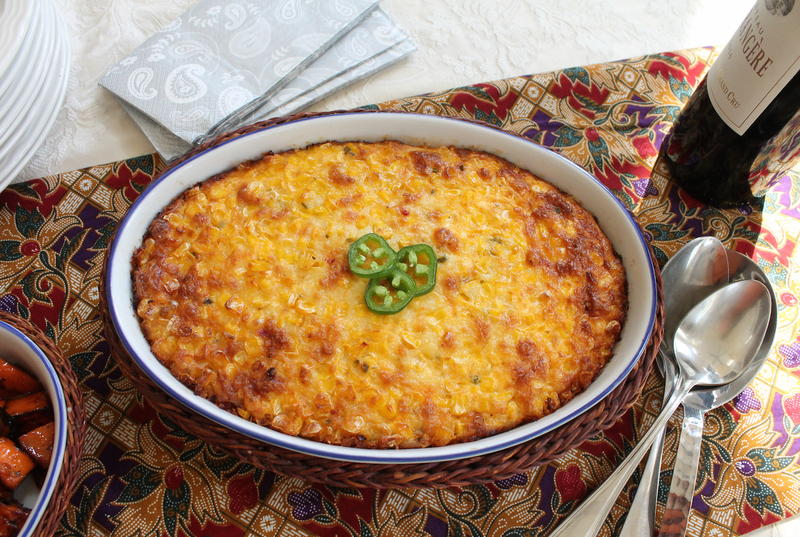 If you are a fan of cheese and spice and corn, you are going to love this cheesy jalapeño corn casserole. 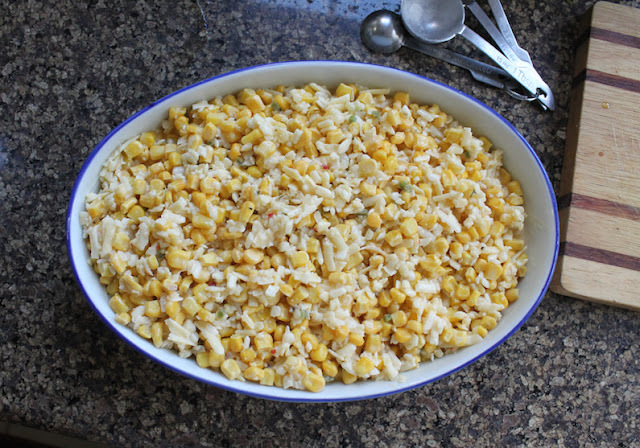 The whole dish is great, but that golden top is the absolute best part. 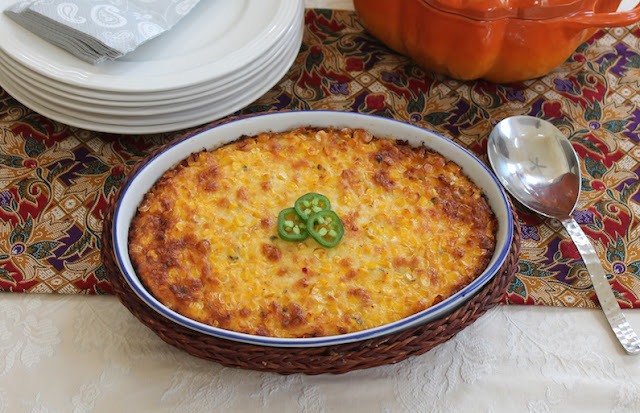 I must confess that in my family we have a standard set of sides that must be made for Thanksgiving and Christmas and this cheesy jalapeño corn casserole isn't on that list. 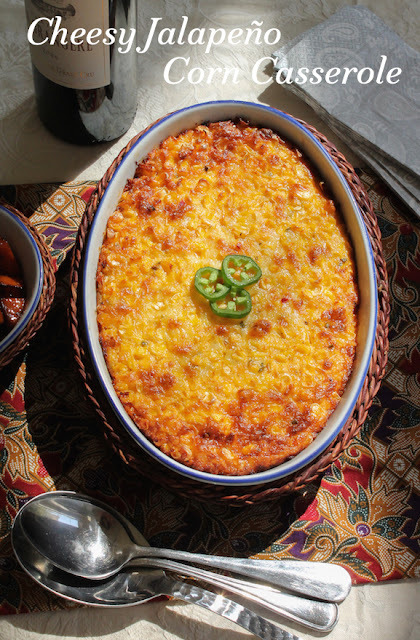 Not because it’s not perfectly spicy, cheesy and delicious. No, it's because that list was set in stone many years ago and no one is allowed to alter it. In fact. lest we forget, the list is kept at the front of my recipe binder, in a little pocket. Along with the turkey and stuffing, we must have rich creamed potatoes, sticky sweet potatoes, maque choux, green beans with baby new potatoes and, of course, my aunt's best pecan pie for dessert. Is it only my family that is so set in our ways? 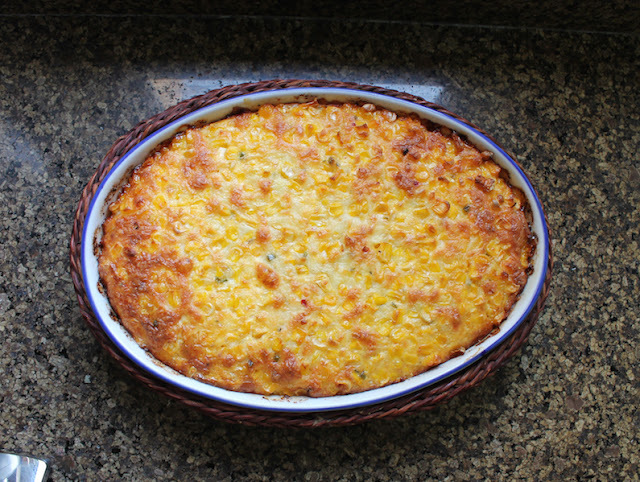 If your family is not as persnickety about the holiday menu, you’ll want to add this casserole to your line up. Never mind, if they are. Just make it for a Sunday Supper. Use one tablespoon of the butter to sauté the onion, garlic and jalapeño in a small saucepan, over a very low heat, just until softened, about 5-7 minutes. The onion doesn’t need to color, just soften. Remove from the heat and leave to cool. Preheat oven to 350°F or 180°C and use the other tablespoon of butter to grease your casserole dish. Toss together cheese, flour, mustard powder, salt and pepper in a medium bowl. 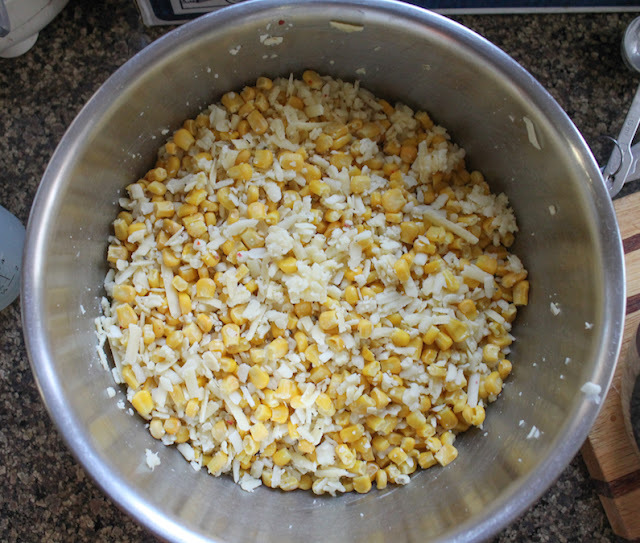 Add in the corn and mix well. Set aside. 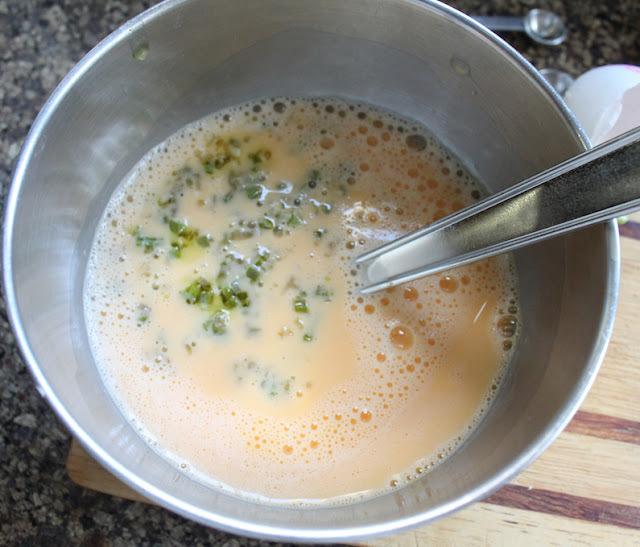 Beat the eggs and whisk in the milk and the sautéed vegetables. Pour milk/egg mixture in the corn/cheese mixture; stir well to blend evenly. 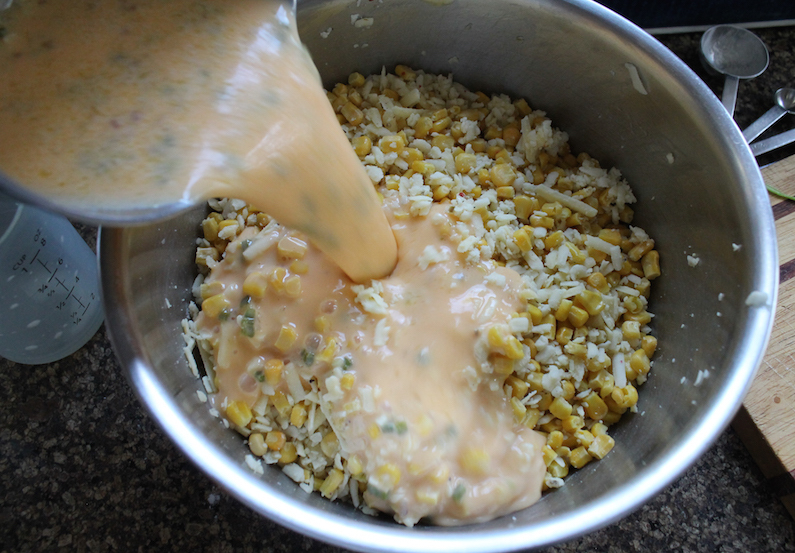 Pour the combined mixture into your buttered casserole dish. It looks a bit dry on the top but don't worry, the egg and cheese will rise up and created a beautiful almost soufflé like texture throughout. Bake in your preheated oven for about 35-40 minutes or until puffy and golden on top. The middle should be ever so slightly jiggly when you take it out and will firm up as it cools. Check out all the other special tasty side dishes our Sunday Supper tastemakers are sharing today! Many thanks to this week's host, Caroline of Caroline's Cooking and our event manager, Renee of Renee's Kitchen Adventures for all of their hard word.